Absinthe is an alcoholic drink made from Artemisia absinthium (a plant better known as grand wormwood) and a range of other herbs such as fennel, anise, melissa and hyssop. 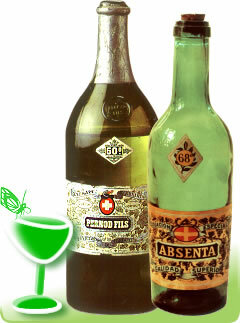 Actual recipes have always varied by country and manufacturer, as has the quality of each absinthe brand. Traditionally, the drink was quality-classified as either absinthe suisse (the best grade; alcohol content of 68-72%), demi-fine (50-68% alcohol) or ordinaire (45-50%). Today, it is thought that there are about fifty brands of the absinthe drink available, produced mainly in France, Switzerland, Spain and the Czech Republic. Absinthe is usually green, although there are a few Swiss varieties that are clear. Best absinthes are made exclusively with all-natural ingredients and have no artificial colourings added. Quality green absinthe always gets its colour from the chlorophyll released from the herbs. Absinthe first gained its notoriety in the latter part of the nineteenth century, when it became the drink of choice among bohemian intellectuals, writers, poets and artists in France and across Europe. Soon, the emerald green liquor was consumed by people from all walks of life. While the lower classes celebrated l'heure verte (the green hour) in Parisian bars and cafes (a pre-dinner period when patrons drank a glass or two as an aperitif), painters and poets created art and poems dedicated to La Fee Verte (the "Green Fairy" ) as the drink became known. At that time, absinthe was far more than just another alcoholic beverage: absinthe was the very icon of la vie boheme, even a way of life for some. The Fairy reached the shores of America, too, where the drink became especially popular in New Orleans. Absinthe was originally served with chilled water, which was poured into a glass of the green spirit over a sugar cube that was placed on a perforated spoon resting on the top of the glass. Although other methods of drinking absinthe have evolved since, especially in the late 1990s, the original nineteenth-century ritual of preparing absinthe, known as la louche, remains an important part of the absinthe experience for all serious absinthe connoisseurs. A drink with strange powers? It is believed that the louche process of adding water to the strong alcohol allows the release of essential oils from the herbs from which the absinthe drink is made, particularly thujone-bearing wormwood. These oils, drinkers believe, not only counter the usual intoxicating effects of alcohol, but they also bring the mind to a peculiar state of alertness, enhance one's sensory perception and even unlock hidden creative powers -- hence absinthe's popularity among nineteenth-century avant-garde artistic community. Perhaps the most remarkable celebrity absinthe drinker of that age was the Dutch post-impressionist painter Vincent van Gogh. Painters Henri de Toulouse-Lautrec and Paul Gaugin were also fond of absinthe, as was the child rebel poet Arthur Rimbaud. Paul Verlaine, Charles Baudelaire, Oscar Wilde, Ernest Hemingway and many others writers, poets and artists also drank absinthe for its unusual effects. A fairy or a devil? The amazing popularity of the Green Fairy caused her eventual downfall. Many European governments, as well as the U.S. administration, gave in to the pressures of the anti alcohol lobby and banned the drink in the early years of the twentieth century. Absinthe proved a relatively easy target for the anti-alcohol movement, which blamed wide-spread "absinthism" -- a mental condition the drink supposedly caused -- for a whole range of social problems. French winemakers, nervous about the sharp decline in wine consumption, also backed the calls for the banning of the "green devil". The drink was never banned in a few European countries, notably in Spain, the Czech lands and the United Kingdom. Consumption was relatively low, however, and it took almost a hundred years for the Fairy to make the grand comeback we are witnessing today. So is absinthe legal again? Absinthe is legal once more across all member states of the European Union, thanks to a 1988 Europe-wide law that re-allowed wormwood as ingredient in alcoholic beverages. In the United States, absinthe still cannot be sold in bars or stores, although personal possession and consumption is legal. Absinthe is sold in Canada, Australia, Mexico and Japan. Laws in other countries vary. Modern-day celebrities who have developed the taste for the drink include Johnny Depp, for example, as well as the controversial Marilyn Manson and Eminem. The singer Bjork brought the latest absinthe fever back to her native Iceland a few years back. A host of Hollywood stars are known aficionados of the Green Fairy, as is the former Czech president Vaclav Havel. But even today, the story of absinthe remains one of polarised opinions: romanticised by many, and damned by a few. While an increasing number of people are rediscovering the delights of the Green Fairy, a small minority still wag their fingers and talk of the green devil. Got something to say about the absinthe drink?